Whether you’re already a sax player, or you’re looking to become one, buying a new instrument – especially one as complex as a saxophone – is never a task that you should take lightly. Fortunately for you, we have the experience needed to recognize the best alto saxophone on the market, and we’re willing to share it, so stick around for some excellent tips on how to pick the right one! Does It Come With All The Essential Accessories? Which One’s The Best Alto Saxophone? There’s nothing more exciting for an aspiring sax player than buying a new horn. However, with all the excitement that goes into choosing the best alto saxophone, it’s easy to forget that buying a used one is an entirely legitimate option, too. If you do decide to go down that route, at least MAKE SURE you do extensive research beforehand. Otherwise, you might end up spending way too much on getting it to play in top condition. It depends on your level of commitment. In the long run, though, it’s always cheaper to buy than to rent. Seemingly low rental fees can quickly add up to a number much higher than what you would’ve initially spent if you bought an alto saxophone, instead. And with the help of the following guide, you can be sure you won’t regret your purchase any time soon! Buying the best alto saxophone online can be a tricky business, and the fact that a horn is a pretty complex instrument doesn’t help, either. That’s why it’s vital to do some research on the subject and have at least a basic grasp on what it is you’re looking for, even if you’re entirely new to playing a sax. Here are some things you need to pay attention to if you want to be sure you’re getting the best alto saxophone for the money. Yes, saxophones are recognizable for their yellow brass bodies, but if yellow isn’t exactly your style, don’t worry. Now, more than ever, manufacturers are trying their best to meet the aesthetic needs of players. For instance, it’s not unusual for a saxophone to have the standard brass body, but with a twist – the bell or the neck can be made from a different material, such as copper, bronze, or sterling silver. When it’s time to kick things up a notch, silver plating is the way to go. Adding more weight and hardness results in clearer projection, and much higher volume. Make yourself heard! If you want your instrument’s sound to stand out, we recommend you choose nickel plating. After all, it’s not the go-to choice of jazz players for no reason! Not only will these metals add some weight and fullness to your saxophone, but their softness will produce richer and darker tones, as well. There’s more than just the visual effect at play here – these finishes are more substantial, which reflects on the sound, as well. Isn’t there a standardized key layout for all saxophones? You’re right, there is, and it’s called the basic key stack. However, some models will have additional keys, as well, with the purpose of helping you play specific notes more efficiently, especially at the edges of the saxophone’s range. Beginners can easily be tricked into buying a bunch of unnecessary stuff, but the complete opposite could happen, as well – you might buy a saxophone that doesn’t come with some essential accessories that are needed to get you started. Luckily for you, though, you have us in your corner. The good news is that most beginners to intermediate range saxophones do come with a mouthpiece. The bad news is that most of them are of poor quality, and you should replace them. But it’s one less thing to worry about for now. Make sure the set includes some reeds, too, because you won’t be able to do much with your saxophone without it – except looking at it, that is. Most saxophones will come with a case, too. It may not be of the best quality, but something is always better than nothing, right? Regular maintenance and cleaning is key to having a long-lasting best alto saxophone, which is why you need to make sure it comes with at least a basic cleaning kit. When it comes to setting a budget limit, we have great news for you, especially if you’re starting out! Even though you might expect the difference between cheaper and more expensive instruments to be huge, the truth is, the gap has been slowly narrowing down over the recent years. That means you won’t have to spend a small fortune on the best alto saxophone – you’ll be able to find some pretty decent instruments for less than $500. The first candidate for the title of the best alto saxophone is a model by Mendini – a budget-friendly, ribbed, brass-body horn made with beginners in mind. 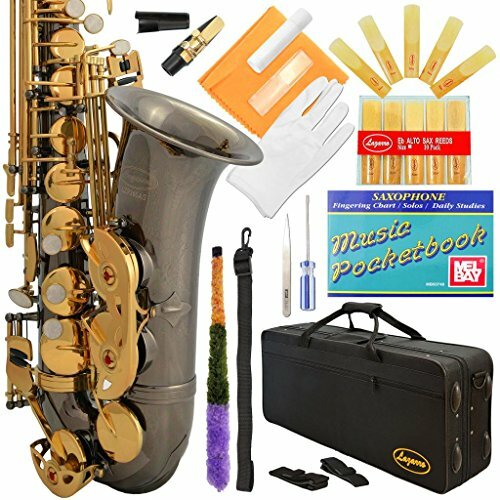 Not only do you get a saxophone, but all the essential accessories, too – and then some more! The package includes a mouthpiece, ten reeds, a neck strap, hard-shell case, cleaning accessories, and, of course, white gloves. That’s not all, though – you’ll also get a chromatic tuner with a metronome, as well as a pocket-size saxophone booklet with all the information you might need as a beginner. We did notice it had poor initial adjustments, but with a little fine-tuning, we were able to get a pretty decent sounding alto saxophone. If you’re not sure where to start, we’d recommend going to a music shop and asking them for help. There’s one issue that’s not so easily fixable, though. Some of the keys tend to stick – the A key gave us the most trouble in that regard – and we couldn’t help but wonder if this would only get worse with time. If you’re a fan of the standard yellow brass body with a transparent lacquer finish, you’ll fall in love with this Jean Paul model, for sure! Two things you can expect from the instrument itself are durability and smooth key action. Most student-aimed music instruments are built to withstand heavy and not-so-careful use. The power-forged keys and the sturdy bell brace only further reinforced our opinion on the matter. It comes with several much-needed accessories, such as a mouthpiece, one reed, cork grease, cleaning gear, as well as gloves. And while we loved the versatility of the case it comes with – it can be carried by its handle or in the form of a backpack – the seams and the overall feel didn’t seem very durable to us. Also, it would be better if you would go ahead and buy a mouthpiece, ligature, and reeds separately. We appreciate the fact that you get them, but if we’re honest, they’re not very impressive quality-wise. Plus, you only get one reed – and you know you’re going to need more than that, anyway. We’re pretty sure this Glory model is as budget-friendly as they go. 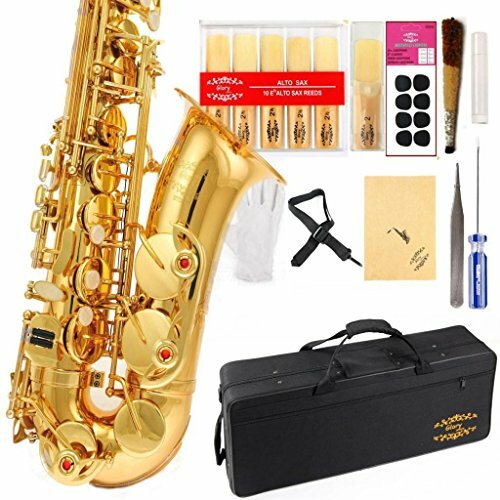 Specific features, like the leather pads with metal resonators, a comfortable metal thumb rest, and the adjustable key height screws, show that, although cheap, this saxophone means business. You’ll get all the essentials, too – from eight mouthpieces, 11 reeds, and a neck strap, to gloves and a cleaning kit. At this price point, it’s an offer that’s hard to beat. Most importantly, it’s shipped ready to play, meaning you can start working on releasing your inner jazz player as soon as you receive your alto saxophone. It’s far from perfect, though. For instance, the mouthpiece it comes with is not of high quality, and you’ll probably have to replace it soon. And since we’re on the subject of additional expenses, the neck strap lacks any padding, so we’d recommend getting one from a different manufacturer, as well. Overall, we’re under the impression that the saxophone was put together without paying much attention to craftsmanship. 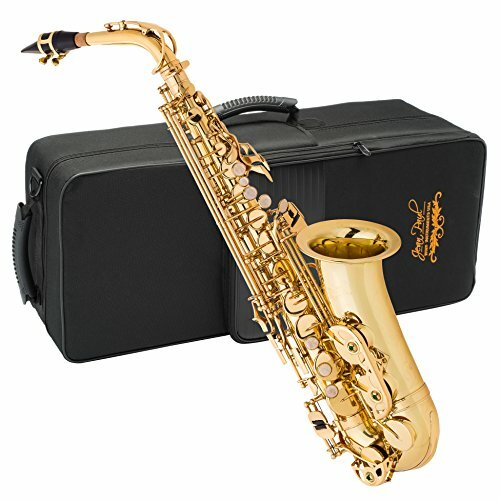 That said, it’s incredibly cheap, and as such probably best suited for beginners and kids that are figuring out if playing the sax is something they want to pursue. So, if you’re not a huge fan of yellow brass, Lazarro has you covered. You can choose whichever color you like, without sacrificing something in return – regardless of the finish, there’s a consistency in durability and sound quality. The key layout is pretty standard, although it does include two of the additional keys we’ve talked about – the high F# and the front F key. Furthermore, it has adjustable key height screws and high-quality leather pads with metal resonators. You’ll find everything you need in the package, too – a mouthpiece, reeds, ligature, neck strap, a reliable cleaning kit, and much more. 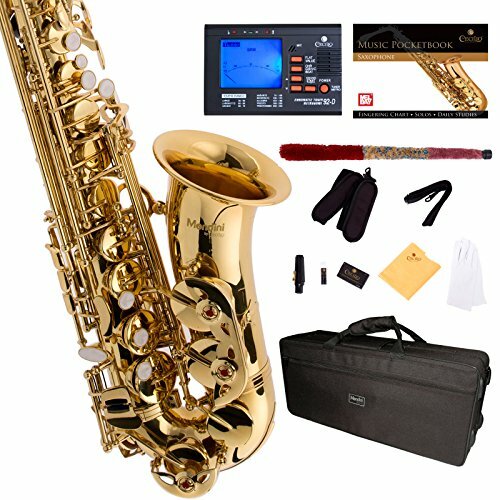 Now, the accessories included in the package might not be of the highest quality, but you can expect that from saxophones in this price range. We’re yet to find an affordable horn that doesn’t require any additional expenses. The saxophone sounds excellent, though – and that’s what counts! No round-up of the best alto saxophones could be complete without a Yamaha model, right? Now, the reason why we picked this exact model for our list is the price. Everyone knows how expensive Yamaha saxophones can get, but this one sits well below the $1000 mark. The yellow brass body paired with nickel plated keys looks amazing and has a solid feel to it – something you don’t see very often in cheaper models. The keys (including the additional front F key) are all power-forged, too, so you know durability won’t be an issue, even with more aggressive play styles. Most importantly, though, the saxophone comes with optimum intonation (no adjustments needed), which helps a lot if you’re a beginner or a student trying to establish a baseline. We didn’t experience any of the common issues we’ve had with other alto saxophones on this list, which wasn’t that much of a surprise – there’s a reason why Yamaha is a popular choice among saxophone players. If you’re willing to spend a bit more to get the best alto saxophone and look like a pro, this is the one to keep an eye on, for sure. It wasn’t an easy decision to make, but after careful deliberation, we’ve decided that the Yamaha YAS-23 Standard Eb Alto Saxophone is the best alto saxophone on the market in 2018. It has some outstanding features that every sax player will appreciate, without being overpriced – you can’t ask for more than that! If you need some additional peace of mind, you can listen to these instruments play on YouTube, too. And, of course, if you have any questions, feel free to leave a comment below!